North Korea and South Korea signed an agreement in defence sector as well as a joint statement following the results of the summit in Pyongyang. South Korean President Moon Jae-in and North Korean leader Kim Jong Un have in fact proclaimed the end of the state of war, the South Korean presidential spokesperson said on Wednesday. "Leaders of the South and the North have in fact announced the end of the war on the Korean Peninsula by their agreements," the spokesperson said. Leaders of North Korea and South Korea have signed a joint agreement following the summit in Pyongyang. Also, the agreement in military sphere was signed by South Korean Defense Minister, Song Young-moo, and North Korean Defense Minister of People's Armed Forces, No Kwang Chol in the presence of the two states' leaders. After the meeting, North Korean leader promised to visit Seoul in near future. He also said that both nations agreed to make efforts to denuclearize the peninsula. Meanwhile, South Korean president said that Seoul an Pyongyang agreed to remove threat of war on Korean Peninsula. The joint statement also said that the works on connection of roads and railways between the two nations would start before the year's end. Seoul and Pyongyang also agreed to send joint team to 2020 Olympic games as well as to submit joint bid to host 2032 games. The meeting of the nations' leaders took place on Wednesday in the "one-on-one" format in the official residence for the honorable guests. The persons accompanying the leaders were waiting for the end of their conversation in the corridor. The two nations agreed to cease large-scale artillery exercises and military flights near demarcation line. They also agreed to withdraw servicemen from the demilitarised zone and disarm personnel in Panmunjom truce village. Two Koreas agreed to create 80-kilometre zone free from military exercises in Yellow sea, sea of Japan. Earlier, a spokesperson for Seoul administration confirmed that DPRK and South Korea would sign a military agreement and a joint statement after the summit. South Korean President Moon Jae-in is on a three-day visit in Pyongyang, which the first visit by a president of South Korea to Pyongyang in nearly 11 years, as former president Roh Moo-hyun travelled to North Korea back in October 2007. 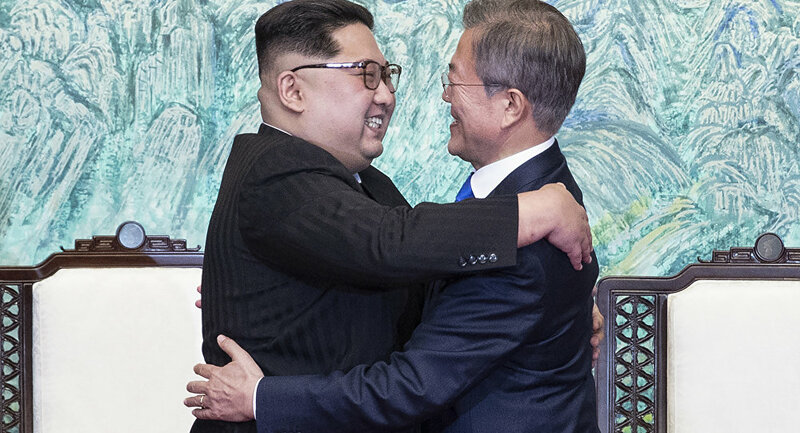 During South Korean President's visit it was planned that the leader would twice hold talks with Kim Jong-un and discuss further improvement of relations, denuclearization and development of dialogue between North Korea and the United States.